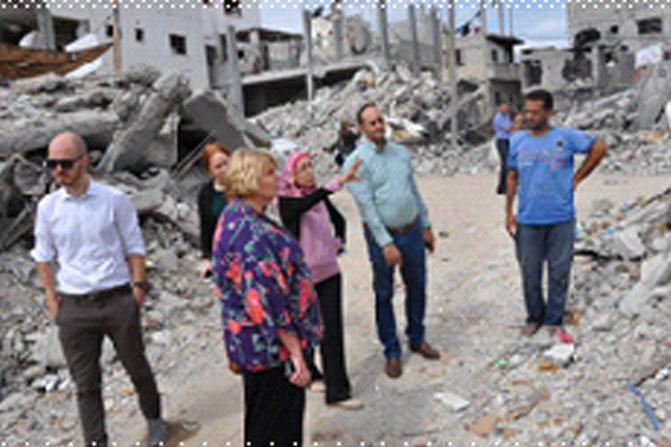 APF Forum Annual Meeting and Field Visit to Gaza 28th to 30th September, 2014. UN women, ACT strategic plan 2015-18, emergency response appeal and capacity building held APF forum annual meeting in Gaza at New Roots Hotel from 28-30 September 2014 discussing important topics including women conditions in the last Gaza war. During their stay in Gaza, 42 delegates from ACT Palestine Forum made field visit to NECC Shijaia Clinic, including its programs: Well-Baby Services, Pharmacy, Nutrition, antenatal and postnatal care, Family planning, and psychosocial Program and they made a visit tour at NECC TVET Center located in Shijaia area including the two departments of: Carpentry and Furniture making, Metal works and Aluminum. In addition they visited the destruction places in Shijaia Area after the protective edge war on Gaza Strip.